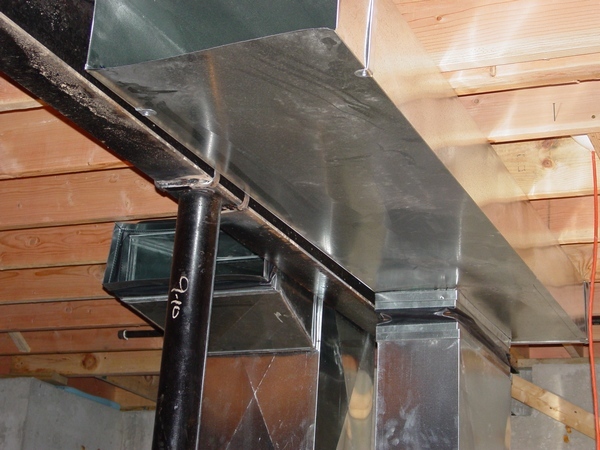 With reference to the basement part of the installation, heat run means a pipe with fitting, which starts from a Take-off and terminates with a boot nailed to the opening in the floor or connects to a Bathbox or Oval Stack. The work which should be carried out in the basement begins at that stage when all trades have finished the Rough-in and the house has passed the Rough-ins and Building inspections. Describe in details how this or that tip or trick was implemented and get any paid page for free! Submit an additional tip or trick of your own and get any five paid pages free of charge! You can purchase any tip or trick below and if you purchase the e-book as whole I’ll refund your money back to your PayPal account. Years ago, when exterior walls were built from 2 x 4-s it was very important to connect an Oval 90* to Oval Stack before it has to be dropped in the basement. Not anymore! Nowadays you can just drop it for a couple of inches down just like in the interior walls and hook it up in the basement later. The situation that you can see in the picture occurred because a rougher made some kind of math mistake. My teammate comes up with a weird idea how to fix it, but I resolve this issue in five minutes! How did I do that? If you need the answer click on the "Buy Now" button below and get step-by-step instructions instantly for only $1.00! There are 5 pictures on the page. How did I hook it up? Find it out on the paid page. For the price of only $1.00 you can get this issue resolved! There are 2 pictures on the page. Have you ever needed a 12" galvanized pipe, or maybe 14”, or 16”? If so you can easily make it from the pipes of a smaller size. For the price only $1.00 you can learn a simple technique how to make a large size pipes from the smaller ones! There are 6 pictures on the page. This thing in the photo is a slip-on cap. They use it as a top cap for a plenum. Normally this type of caps made on a Manual Straight Brake machine and the worker do not squeeze the hem too tight, but this one was made on the other kind of machine that rolls the hem right through. This operation makes the hem very tight and subsequently deprives an installer from making the plenum box! However there is a simple technique that allows you to open the hem up in a matter of seconds! For the price only $1.00 you can learn this technique on the paid page. There are 8 pictures on the page. For the price only $1.00 you can find explanations how to take a duct apart, please use a Buy Now button below. There are 4 pictures on the page. Please click a BuyNow button below and for the price only $1.00 you will learn this simple trick! 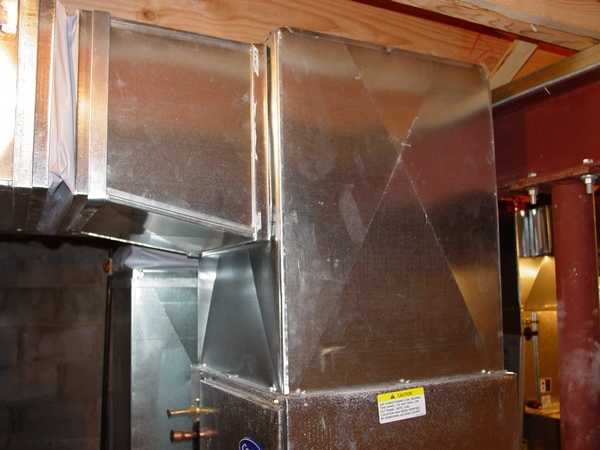 For the fast and easy ductwork installation it’s very important to know how to organize your job site. For many it’s a no-brainer and they were trained to do it right from the beginning, unfortunately for others it’s not the case. There are 35 picures on the page. So, I would recommend you to pay just $1.00 and get an instant access to this page. Believe me you won’t be disappoint, because along with the stuff that you are definitely know and doing on your job site you’ll find something that is going to be a very helpful for your work! Of course if you need 8’ or even 4’ of duct it would be better to order it from the shop. But if you need a shorter piece, then just make it from the duct you have! Are you wondering what should be done? For the price only $1.00 I’ll answer this question. Just click a BuyNow button below and get an instant access to the info you are looking for. If you don't need all 44 Tips & Tricks that's fine! Pick the chapters you need, add more paid pages at discount price from the other parts of this website, create your own e-book on this page and save!